As the renminbi gains international acceptance, Chinese firms look further afield for growth. Following this summer’s market turmoil in China, it is hard to remember how the market looked before the government’s devaluation of the renminbi in August. Before this, everyone was piling into the market with practices that were long regarded as suspect, such as lending on margin to buy stock. Optimism was heady, as it is in all bubbles. The A-share market collapse has humbled several institutions, not least China’s Citic Securities, whose executives are under scrutiny as part of a government probe regarding allegations of insider trading. Beyond the market noise, however, lies a story of offshore financial institutions grappling with the changes in the world’s second-largest economy. These include slowing, but still substantial, economic growth; a switch in emphasis from investment-led growth to more self-sustaining growth based on domestic consumption; a growing global political profile underscored by initiatives such as the Asian Infrastructure Investment Bank, One Belt, One Road (to rebuild Silk Road trade links) and the Maritime Silk Road, an initiative to encourage investment and foster collaboration across the historic trading route. 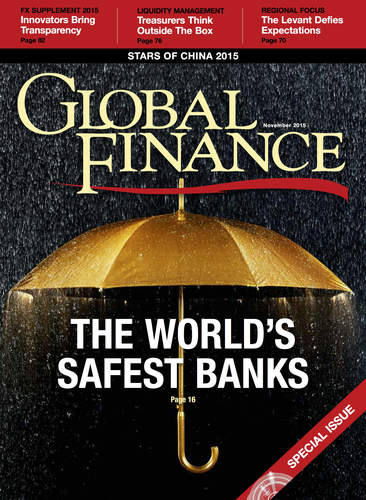 This year Global Finance’s annual Stars of China editors decided to look specifically at those banks that have excelled in products and services that support the evolution of the renminbi into a fully internationalized currency. Not surprisingly, onshore institutions take the lion’s share of the accolades here. This is only natural, given their daily immersion in the currency, both onshore and offshore. But it also reflects the centers of excellence developing in the major Chinese financial institutions, which have evolved into world leaders in a short time. Noise or not, local expertise is going international. Year by year, China Construction Bank has become more globally competitive at a faster rate than any of its peers. It is a major force in the internationalization of the renminbi. CCB has established a centralized offshore renminbi clearing system directly serving approximately 20 countries and regions across five continents. In 2015, it stepped up its internationalization efforts by targeting the main destination countries for Chinese “going global” companies: key financial centers in major economies. Currently, CCB has a total of 22 Tier-1 overseas banks, a number that is expected to rise to 30 by year-end 2015. CCB’s domestic and overseas institutions have conducted cross-border renminbi business valued at more than Rmb7 trillion ($1.1 trillion) for more than 19,000 clients. Offshore renminbi products cover wholesale banking, retail banking, investment banking and wealth management. CCB will almost certainly receive a boost to growth as the government’s One Belt, One Road initiative unfolds. Harbin Bank, based in the northeastern Chinese city of Harbin, tapped Hong Kong’s capital markets in March 2014, raising $1.1 billion. The IPO was a pioneering move for a City Commercial Bank and was followed by several peer listings in Hong Kong. Harbin’s emphasis on tight credit control has allowed it to enhance its product base and offer an alternative to growth companies that have had difficulty obtaining credit from state lenders. By necessity, China Cinda, a company set up to clean up bad bank debt in China, demonstrates better corporate governance. In April 2015, the company raised some $3 billion in a bond offering, a demonstration that investors think the group is a safe bet in a slowing economy. Following this summer’s market turbulence, China Cinda cut ties with CITIC Securities, which is under investigation for its brokerage practices. In the past 18 months, ICBC instituted an across-the-board retail strategy geared toward improving customer service, integrated service capabilities and its market interface with retail banking. One result: ICBC moved ahead of other banks in its personal loans, banking wealth management and credit card businesses. At the end of 2014 the bank had 465 million personal customers, including 9.6 million personal loan customers. The Singapore bank’s ability to spin out wealth management tools for its consumer banking clients wins it this year’s Stars of China accolade. Internally, DBS introduced a value-added “3+1” service model designed to better serve the needs of China’s growing affluent class. Under the model, customers are offered a professional wealth management consultation based on their risk appetite and needs. Bank of China has repeatedly offered credit-worthy customers access to credit with relatively little fuss. Its platinum card is a favorite among international travelers from China, with a credit limit of up to Rmb2 million and a grace period of up to 50 days. It is a badge for new affluent globe-trotters from the mainland. to medium-size enterprises. It offers spend management options that help company controllers and CFOs maintain governance over corporate card programs, as well as a high level of detail on individual spenders. Talk about showing verve. In January this year, ICBC launched a medium-term note program on the Luxembourg Stock Exchange, enabling ICBC to issue bonds on a regular basis. Tranches from the program are to be listed on Euro MTF and the Luxembourg Stock Exchange. ICBC continues to lead the pack in venturing out of the China comfort zone. syndicated-loan lead banks in Asia-Pacific. ANZ has been in China since 1986 and today boasts six branches and four sub-branches, as well as an operations hub in Chengdu. The bank has partnerships with the Bank of Tianjin and the Shanghai Rural Commercial Bank. In 2010, ANZ became the first Australian bank to be locally incorporated in China. It is still the only Australian bank with both local and foreign currency capabilities in corporate banking and retail banking on the mainland. BOC raised the equivalent of $3.6 billion for Silk Road projects this year, in the first public bond issues to finance infrastructure along the trade route between Asia and Europe. The bank has been key to the government’s initiatives to expand trade with Central Asia, Europe, the Middle East and Africa. On the information side, BOC launched a bond trading index in October. Managed by Bank of China Shanghai, its goal is to encourage more efficient trading on the interbank bond market while making it more transparent for overseas investors. Goldman Sachs may still be trying to catch its breath this year trying to keep up with the Bank of China, which earned more in fees from debt market transactions in the People’s Republic of China than the New York powerhouse, according to Reuters. However, Goldman Sachs is still the go-to Western bank in debt capital markets for China and is likely to catch up as bond market stability in the wake of this summer’s volatility brings more capital raisers to the debt market. CICC plays a leading role in Chinese company IPOs in Hong Kong and domestic China. It boasts superior capabilities in investment development and has helped cornerstone investors successfully complete large transactions. Examples include the H-share IPOs of Wanda Commercial Properties and CGN Power. The firm’s research department ranks among the most influential in China. You either run from volatility or learn to handle it. That was probably the thinking when UBS increased its stake in its UBS Securities (formerly Beijing Securities) joint venture to 25% in June, not long before the market ructions that have been a principal part of this year’s news. The other shareholder is a state-owned asset holder. Before their heavy-handed response to August’s market meltdown, China’s securities regulators toyed with the idea of greater participation by foreign investment banks, based on the theory that it might help mitigate the boom-bust cycles of China’s A-share market by bringing in more institutional money. That initiative has since been put on hold, but UBS’s commitment will surely not go unnoticed when the mood of openness reemerges. ICBC offers a number of capabilities in forex that only the Bank of China can rival. Its sheer size and presence in China (17,110 branches locally) and internationally, with operations in 41 countries, as well as correspondent bank relationships with more than 1,800 overseas banks, makes it the largest Chinese institution overseas. In China it leads the local treasury operations market. Growth in foreign exchange sales has been incremental but steady, increasing 1.8% to $1.7 trillion in the first three months of 2015, compared with the same period a year earlier. Its wealth management business recently increased its personal services for foreign exchange trading. ANZ’s incoming CEO Shayne Elliott took the helm on October 1, and immediately announced his commitment to the bank’s long-standing Asian expansion strategy, but with the accent on more discipline in implementing it. ANZ is Australia’s fourth-largest lender. Investors have become impatient with Asia’s high costs and weak returns. ANZ has invested in 15 Asian countries, where it focuses on foreign exchange, cash management and debt markets. Last month it opened a new branch in China; and on October 2, it opened its first branch in Myanmar. AIIB wins this year’s Stars of China infrastructure lending accolade for its game-changing potential. Analysts see it as a challenge to the World Bank and Western hegemony over the global financial system. China says it is merely presenting an alternative for nations in Asia seeking to build ports, airports, roads and other necessities to meet the need of their growing economies. Many rich European countries have endorsed the institution. Meanwhile, the United States is watching with interest. BNP Paribas is one of the few Western banks to have built on its Chinese presence in recent years; most others have whittled theirs down. Infrastructure lending by European financial institutions has declined in the Asia-Pacific, but BNP Paribas has remained firmly in the top 10. In China it has maintained its presence despite a drop-off in general European bank participation in the market and the slowing of infrastructure lending generally, as the economy has slowed. BNP is poised to participate in the next phase of infrastructure lending, as China expands overseas and across central Asia as part of its One Belt, One Road and Maritime Silk Road initiatives. Guangdong Huaxing was opened in 2011 to promote bank financial services for smaller companies in Guangdong province. At the time, the bank said it would focus on financial product innovation for small to medium-size enterprises. Harbin Bank (winner of the City Commercial Bank category in this year’s Stars of China Awards) has since taken a stake in Huaxing, injecting funds and overseeing a restructuring with an emphasis on creating products for SMEs. CICC was established in 1995 as a joint venture between China Construction Bank and Morgan Stanley. Morgan Stanley sold its 34.3% stake in 2010 to KKR, TPG Capital Management, Singapore sovereign wealth fund GIC and Great Eastern Life Assurance. CICC’s Hong Kong IPO filing in July this year was expected, but the turmoil that beset markets this summer has temporarily put the issuance on hold. It entered the top ranks of Chinese M&A banks last year and has managed to retain its mantle. CICC is one of the lead equity underwriters in China, second only to CITIC Securities, but it may now improve its position when the market picks up again while CITIC is still grappling with government accusations of insider trading. Deutsche Bank announced in September that it was pulling all investment banking operations out of Russia. It has taken a different tack with China, where it is reported to be mulling the sale of its 20% stake in Hua Xia bank amid a global restructuring initiative. Ownership in an onshore financial institution turns out to have limited upside to Deutsche’s already substantial presence in the region. Deutsche says it remains committed to growing on the mainland, where Henry Cai, the bank’s executive chairman of corporate finance for Asia-Pacific, helped build the global institution’s clout. In October, it anounced that it would be a direct participating bank in the new China International Payment System for cross-border renminbi payments. Over the past three years, CICC has participated in Chinese domestic M&A transactions totaling more than $86 billion. Only CITIC Securities has completed more deals in dollar value terms. CICC statistics show it participated in 37 China-related M&A deals in 2014, with its two biggest deals last year driven by state-dictated reforms. CICC’s secret? It has developed deeper expertise than its investment banking peers, specifically in the area of market-oriented acquisitions, which have higher requirements on the financial adviser’s structuring, coordination and execution capabilities. During 2014, CICC advised on a number of major group company asset injection deals, outperforming the competition in terms of market-oriented M&A advisory services. DBS hit the top of Bloomberg’s Southeast Asian M&A rankings in the middle of last year. This has only obscured its dynamic track record in China. In 2014, DBS helped Alibaba acquire a 10% stake in Singapore Post for $249 million. DBS has the largest bank network in Southeast Asia and is ideally placed to assist Chinese companies and their “going out” strategies and to capture business related to such government initiatives as One Belt, One Road and Maritime Silk Road. ICBC’s extensive branch network has allowed it to set up 36 private banking centers and 400 extended service centers covering all major cities across China. Its private banking unit, which was established in 2008, has tapped into demand for individually tailored products for affluent customers by offering a range of investment options across fixed income, equity, funds, insurance and foreign exchange. Citi’s private banking operations in greater China have been acquiring talent recently, with hires from main competitors. Its new managing director, team head and senior private banker, Rebecca Lum, hails from J.P. Morgan and, before that, UBS. It is developing expertise in areas that align with the growing sophistication of affluent Chinese customers. Citi is a pioneer in private banking on the mainland, being the first major global institution to set up private banking operations there. It is the first banking institution to set up a separate private-banking office in Shanghai. The largest rural commercial bank in northwest China has an unusual new investor, JiShi Media, which invested $65 million earlier this year. It is in expansion mode, with 49 branches and counting. Jilin Jiutai recently established 26 rural banks and three rural commercial banks—owned wholly or through majority holdings—across nine provinces in China. HSBC was an early entrant into rural lending in China. It is also a frequent innovator, starting with its microfinancing initiatives and partnering with NGO Women’s World Banking in China. Although the bank has struggled abroad this year, it has sustained its commitment to rural lending and microfinance and still remains the foreign institution with the greatest commitment to rural lending. With a slowing economy, the government has encouraged the large state-owned Chinese banks to enhance their small-business lending programs. ABC has lived up to its name by offering loans to farmers and agriculture-related businesses. Agricultural lending grew 13% in 2014, with ABC one of the leaders in the expansion. Standard Chartered is able to link its small-business lending guarantee program to many other services and benefits required by small and growing businesses, such as cash management, transaction handling fee waivers and value-added services. The service is tailored toward smaller companies in growth mode with a high level of transactions and an eye to lowering transaction costs. Since the launch of its custody services business, ICBC has participated in the development of many domestic innovative investment products. It is the first domestic bank to pass the International Standard on Assurance Engagements 3402, for user organizations and their auditors on the controls in place at a service organization. It is also the first to launch and regularize disaster recovery drills for asset custody in China. Standard Chartered’s award of best subcustodian comes as no surprise, given the bank’s unparalleled network in Asia. The bank brings to its subcustody business a single point of contact, services across multiple markets, direct access to operational support and centralized client services from within the region and the same time zone. BOC has diversified its supply chain–related financial product system in recent years, introducing a comprehensive suite covering receivables financing, pledged financing and advance payment financing. It offers solutions for purchase of raw materials, production and preparation of goods, and shipping. BOC’s just-in-time and vendor-managed inventory offerings are highly regarded for enabling Chinese manufacturers, as well as their mainland and overseas suppliers, to internationalize. Standard Chartered’s network in emerging markets is the single most important attribute that supports its victory in the supply-chain finance category. It has developed perhaps the most comprehensive network of relationships with small and medium-size suppliers in Asian developing markets. Last year the Asian Development Bank tapped SC first for its SCF lending program, in a risk-sharing arrangement to extend $800 million in supply-chain finance loans to smaller suppliers across the region. ADB and SC will share the risk in the transactions to support the development of intra-Asia supply chains. Bank of China is the most successful onshore bank to extend financing options across the supply chain to all trade finance customers, particularly to SME suppliers. It has programs to help suppliers obtain funding support in the production and preparation of goods, to recover receivables in advance and optimize financial statements. For core companies, it helps maintain or extend payment periods and optimize cash flows. The net result has been an improvement in overall competitiveness of customers’ supply chains. This year OCBC decided to place greater emphasis on corporate trade finance, based on growing trade volumes between the Chinese mainland and Southeast Asia, where the Singaporean institution is one of the region’s largest transaction banks. OCBC’s acquisition of Wing Hang Bank last year saw it absorb Wing Hang’s Chinese branches and also brought it greater access to the biggest offshore trading center for renminbi, Hong Kong. The bank is linking its business to the trade flows of Asia’s future. The strategy behind ICBC’s global cash management service is to serve vigorous “go global” Chinese multinational companies and improve the efficiency of their capital overseas. ICBC’s systems offer cross-border and interbank capital management geared toward enhancing finances across the enterprise and better governance of cash flows. These are the goals of all major state-owned Chinese banks with an eye on clients in the “go global” initiative. But ICBC has invested the most in upgrading and integrating its systems. DBS is one of the few key offshore institutions to continually invest in cash-management-linked services in China. It often develops special programs that bring added value to mainland companies. The bank launched an industry-first working-capital advisory program in China. The program provides insights on corporate liquidity management by benchmarking key drivers of clients’ cash conversion cycle—accounts receivable, accounts payable and days inventory outstanding—and compares their performance against that of select industry peers. About a third of cross-border renminbi settlement transactions on the mainland are handled through BOC. As the main channel for the cross-border use of renminbi, BOC’s business has continuously strengthened. In 2014 the volume of cross-border renminbi settlement conducted by BOC reached Rmb5.3 trillion, constituting a year-on-year increase of 34%. CITIC Securities’ net income tripled in the first six months of the year, after turnover in Shanghai reached record levels. The second half of the year, however, will be inevitably depressed by the stock market’s collapse. Moreover, CITIC Securities is one target among several in a Chinese government investigation into insider trading following this summer’s market turmoil. Nevertheless, this powerhouse has rebuilt its business before and will inevitably gain experience from the knocks it has received since August and build on that experience. Renminbi ETFs allow investors to gain exposure to the renminbi without the need for complicated foreign exchange accounts. China Construction Bank is at the forefront of developing renminbi ETF products. In July it offered the first renminbi qualified foreign institutional investor money market ETF in the eurozone, denominated and traded in renminbi on Euronext Paris. The asset management arm of CCB serves as the ETF’s investment manager. Crédit Agricole CIB has liquidity centers in Paris, London, New York, Tokyo and Hong Kong and operates in another 13 countries. Since it is a major counterparty for many supranational institutions and central banks, it is eligible to participate in most monetary policy programs. Moreover, its expertise in renminbi, with the focal point of its Hong Kong operations, is perhaps the most sophisticated of any French-based institution. BOC is a leader in the internationalization of RMB fixed income instruments and, by extension, a vanguard bank in the expanding global use of the currency. It has issued RMB bonds in many markets overseas including Hong Kong, Taiwan, London, Singapore, Australia, Luxembourg and France. These issues have a diverse customer base, including domestic and overseas business enterprises and financial institutions. In 2012, Maybank was among the first Asean-based institutions to offer trade settlement services in renminbi in line with the Chinese government’s program for cross-border trade transactions. Importers and exporters can now settle trade transactions with eligible companies located in Shanghai, Guangzhou, Dongguan, Zhuhai and Shenzhen, and enterprises outside the mainland. Responsiveness is important in fast-moving forex markets. Deutsche Bank’s wealth management unit has announced plans for an exchange-traded fund that removes currency risk for those owning shares listed on the Shanghai and Shenzhen stock exchanges. The fund, which will track a hedged version of the CSI 300 Index, targets exposure to the renminbi using one-month forward contracts on offshore-traded renminbi. One of the jewels in Deutsche Bank’s hedging crown in China is its structuring of options for Mengniu Dairy in 2014, the first advance on the plain-vanilla variety allowed up to that time. The German bank worked with regulators to understand the boundaries of a new easing of rules covering derivatives and issued the options for the food service company on the first day the rules became active. It provided a model that other banks seeking to introduce new renminbi risk management products can follow. As one of the first banks to offer offshore renminbi hedging products, DBS has held that lead by offering offshore renminbi FX spot conversion, as well as deliverable and nondeliverable forwards, cross-currency swaps, interest rate swaps and FX options. It offers some of the best renminbi research in the business. The DBS Rmb Index for VVinning Enterprises (DRIVE), is the first index in the industry designed to gauge the level of renminbi usage, acceptance and penetration among companies registered in Hong Kong, as well as companies’ inclination to use renminbi in the future. Liberalization of hedging rules by the People’s Bank of China kicked off a rapidly growing interest-rate swaps market in China in 2014. Volumes intensified this year, as onshore corporates looked to benefit with expected interest rate cuts. Bank of China, a leader in offering onshore hedging instruments, is at the forefront, offering clients new products to meet this need. China Construction Bank has been a pioneer in the internationalization of the renminbi, ensuring that it will also lead in the development of much needed interest rate hedging products. This year, CCB signed a memorandum of understanding with the London Stock Exchange Group, essentially an agreement to work together to expand each company’s access to the UK, European and Chinese markets. Earlier in the year, CCB became the first renminbi clearing bank in London. The London offshore renminbi market is the most significant offshore market outside of China. CCB’s chairman Wang Hongzhang says that the bank is committed to promoting and developing renminbi risk management products such as options, interest rate swaps and currency swaps. The bank’s clout in China and first-mover status in London and Europe positions it to grab a significant share of this market as demand intensifies.